Should Every Book of Ever Bring Something New to the Conversation? But some books just absolutely stand out from the others. They totally stick to my skull and I remember them. They’re unique. They seem better than other books in their genre because of this. They’ve kicked the generic bucket or they’ve done this plot twist I’ve never seen in that genre. Or sometimes the plot is 100% average but the writing is the most beautiful thing to ever roam the universe. Either way — I END UP IN LOVE. And I feel like they are the pinnacles of their genre. I love when they say something that not everyone else is saying. Fresh books = my one true love. And then — gasp — I start to demand this of all books. Is that fair of me? Should every book bring something new “to the conversation”? Should they always have an aspect that stands out? Is it fair to ask this?!?! Obviously what makes a book “stand out” probably differs from bookworm to bookworm. And it’d depend on what said bookworm has read too. For instance, when I first read The Hunger Games (published 2008) I’d NEVER read anything like it. It was so unique and original to me. But…there was a series (that I still haven’t read) published before it (2003) called Battle Royale where kids are forced to fight to the death. SO ANYWAY. It always depends on the bookworm and what books they’ve devoured like hungry cheetahs. And obviously there’s “nothing new under the sun” and themes and messages are going to be rehashed a MILLION times. But, for instance, Tithe by Holly Black and Lament by Maggie Stiefvater are both about Celtic myths and creepy faeries — but they couldn’t be MORE different. Same topic. Totally different style and angle. When I read books that all follow the same patterns, they just smoosh together like soggy pineapple pies. Like Pawn and Starters…dystopians that felt totally the same to me. Interchangeable story lines? I THINK NO. I long for things that are different. But if everything is different…does that make NOTHING different?! Do I only suffer from this because I read so many books each year? I guess many books get stuck in the tropes and cliches of their genre. And not every book will resonate with a reader, so even if it is unique, that doesn’t mean everyone will like it. And sometimes books that DO stand out are too underrated and we don’t even hear of them. And this pains my bookish soul. It does. (Look at me, in all this pain.) And we can’t expect authors to read ALL the books in their genre, so how would they know about everything that’s been published?! We can’t expect them to. I still would, personally, like to think that every book could bring something new to the conversation. It doesn’t have to be HUGE! I just want to pick up a book and not feel like I’ve read it before. Maybe this is too much of me to ask?! Maybe I’ve just read too much? WHO WOULD KNOW. But I believe every book needs its own little pineapple sparkle of uniqueness. what say you?!?! 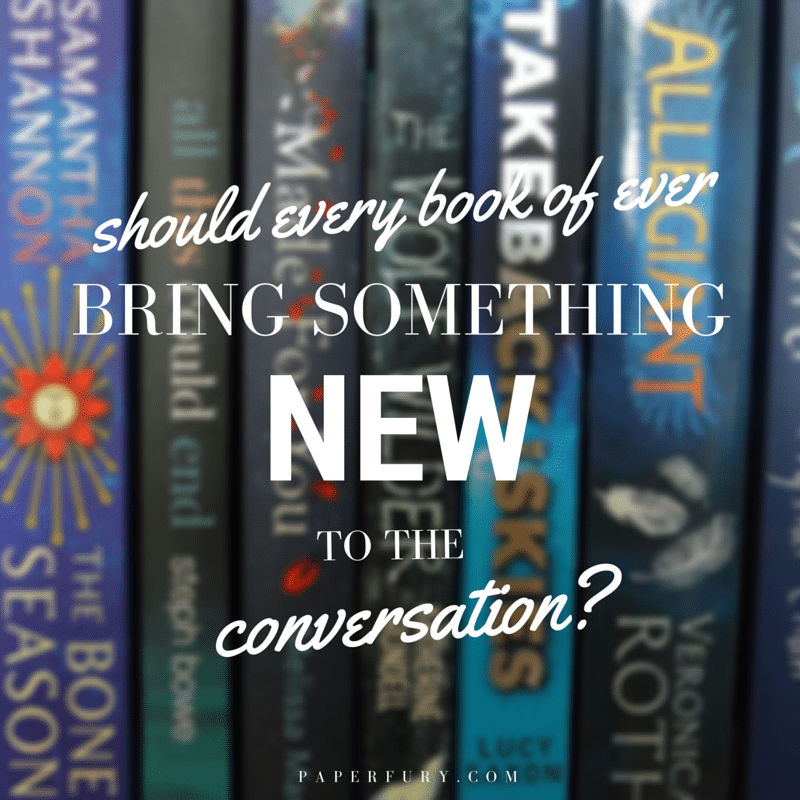 should every book bring something new to the conversation?!? is that a fair request? if every book did, would it make NO book special? or can they all be special together?! HELP. I NEED YOUR THOUGHTS. Personally, I think that whether a book is SCREAM IT FROM THE ROOFTOPS FABULOUS isn’t really whether they’re the most special on the shelf, but rather do something quite typical (e.g. the antagonist) extremely fabulously. So while a unique premise can make me sit up and pay attention, and a completely unexpected plot twist can make me gasp, it comes down to a holistic view of doing all the basic worldbuilding-plot-character things FABULOUSLY, then adding the icing and sprinkles. It’s a matter of not just being unique, but uniquely GOOD. But I think every book DOES bring something new to the conversation. It’s not necessarily something that every single reader sees, but since I’ve also been on the side of creating a book and raising it into a tottering monster, I think that every book HAS to be different from the others on the shelves. It’s so easy to see tropes and such, and definitely no book can reinvent the wheel, but the way things come together is special in each book. I hope that made sense and I wasn’t completely rambling. Oh my gosh I get this and when you said “But if everything is different…does that make NOTHING different? !” I just sort of blanked out because it is much to deep of a thought for to be contemplated at one in the morning. When I read since you’ve been gone by Morgan Matson past year I NEEDED more daring summer lists in my life. It has a great friendship aspect with a great theme mixed in. But I suppose I loved it because there aren’t many books like that. What book idea would you really like to see? I love your points. I personally believe that since every person is different and comes to the world with a unique perspective, if they write THEIR BEST (vs. merely copying someone else success), it will inevitably have a unique angle/point/plot/perspective. It is books that can make me think about old things in a new way that really impact me. I do wish every book I ever read was like that. Think of all the identity crises and philosophical brain burstingness that would involve though! Earlier this year, I was irrationally peeved (I don’t get to use “peeved” as much as I’d like; this is nice) at A Girl At Midnight for what I felt was a blatant ripoff of Daughter of Smoke And Bone – the plot, the characters, the plot twist even. And then just recently, I had a similar experience with Red Queen and Red Rising. The funny thing is, I never thought about it in terms of I DEMAND NEWNESS. I thought I was just outraged at the level of sameness. But when you really break it down, yeah, I was going NEWNEWNEWWWW I WANT NEWWW STORIES. So we’re on the same page. What’s discouraging about this realization is that I don’t think it’s possible for each story to be brand new. I’m a firm advocate of “there are millions of untold stories under the sun”, but I am not as firm an advocate of every human being bestowed with that lust for originality. Sometimes an author will basically write a fanfiction of their own work as their subsequent series. And that’s okay. It has to be. After all, as you said, sometimes it won’t be an entirely new concept that will rope me in, but an element as minuscule as “familiar story, unfamiliar plot twist”, or “familiar story, unique writing style”, or “familiar story, the author can eat me for breakfast if I dislike it, so get on board, brain”. You know. The little things. And I think if every author just puts THEIR unique twist on a story that’s even been told 8920 times….it’ll still feel new and fresh and different. It’s in the details, sometimes, right?! I also want a book to feel new and fresh!! I do understand that some tropes and cliches are a bit unavoidable in certain storylines but I think that an author should always strive to make their book different! And it’s in the details, right?! Like a book can be about a completely predictable trope, buuuut if there is some awesome twist or fabulous humor or great characters, then it doesn’t even matter right?! Now, I have never been in contact with any publishers, nor have I published books so this is just random thoughts. But could it be that editors and publishers that are supposed to help the author before the book gets released, recommend changes to a book because it makes it more like “the next hunger games”? Since we all are different as humans, in what we experienced and so on, I would like to think that if 10 people got to write on the same subjet, that would be 10 different stories. But honestly, I don’t know. Just a thought I had when I read your blogpost. They do LOVE to be able to reference the newest hottest book out there. It’s definitely a valid point that you have stated. There are millions of things that are hashed and rehashed in books after books which sometimes feel too similar. Yes, I agree it might be because we read too many books but it’s definitely not unfair to ask for a little uniqueness in each book and I think that’s enough to make it memorable. Otherwise, we’ll just read the book and forget it, it won’t make a permanent place in our hearts. I love this discussion post so much! Different books are what make me love them so much. Let’s be honest, we read so many books that after a while they all sound the same after a while, so it really takes a unique one to make us really take interest and to LOVE it! SAME. MY MIND IS THE SAME FOR THIS. I kind of think that if each book DID bring something new to the table, then…well, would we notice?! Because we’d have nothing to compare it to?! Omg, it’s a mind twistery question. xD I’m gonna go bury myself quietly in my bookshelf now. I am a firm believer that all books should contribute something new to the genre (or topic of choice). However I have very little tolerance for sexism (especially internalised sexism) and Love Triangles. And while I realise this is going to make me rather unpopular. these reasons are why I was so disappointed with The Hunger Games, Matched, Divergent, and City of Bones. Most of the people I had talked to raved about all those books but I just haven’t been able to read past book 1 in The Hunger Games or City of Bones. To me, City of Bones answered all the available narrative questions. For City of Bones, the twist at the ending is the only thing that saved it and by then it was too little too late (for me at least). The Hunger Games and City of Bones both have really interesting Fantasy and Dystopian genre plots but are shoved aside for the sake of a mediocre love triangle plot, which isn’t that interesting. The characters involved were never compelling enough to carry the full brunt of the narrative focus. .
Or least, that’s my experience, the fact that all those books are on the best-seller lists clearly prove people are into that kind of thing. It probably doesn’t help that I’m at least 10 years older than the desired target demographic. Ah, yes, I can see what you mean (although I adore City of Bones and The Hunger Games XD) but I think books can get caught up in following like the “checklist” of their genre. And they forget to do wild and unexpected things??? I actually like it when books are similar…I mean, you read one thing you like, you just want to read more of it, right? But, at the same time, I do love a good stand-outy book. (And yes, that’s totally a word). It’s good to read something new every once in a while. But at the same time, I do often enjoy seeing a similar storyline to what I’ve seen before…especially when there’s a slight twist on it. I think most books do bring SOMETHING new to the conversation, even if you have to dig through tropes that have been done the same way a billion times to find it (don’t get me wrong, tropes are not bad, but you can be creative with them. You don’t have to use them the same way as everyone else). I mean, Unbreakable by Kami Garcia has been accused of being a Supernatural rip-off, but I think Priest is an interesting character, and I honestly think it’s less of a rip-off and more just something that uses similar mythology (Supernatural didn’t invent the salt circle anymore than JK Rowling invented the magical boarding school trope). Anyway, who says it’s the book that brings new ideas to the table, maybe it’s us who bring the ideas by interpreting the book? I mean, I’ve seen people interpret books in two totally opposite ways – the author can’t have meant it both ways, right? Omg, yes! Tropes are NOT bad. I think sometimes they feel like they’re supposed to be bad?! But tropes are totally fine…as long as you give them a little tiny unique spin. And it doesn’t even have to be huge. Just a little something, in every book, to make it stand out. BOOKS ARE SO SUBJECTIVE TOO. omg. One person loves it, one hates it. XD Good thing there are so many…. OH MY GOSH YES to books feeling the same. I find that the most common with dystopia, I swear pretty much every book in that genre is the same and UGH FRUSTRATION. I don’t actually know how to answer this because at the same time one part of me demands YES I NEED NEWNESS, SPARKLY, PRETTY NEWWW but then another part of me thinks WAIT EVEN IF A BOOK IS QUITE SIMILAR IT’S STILL DIFFERENT. Like there won’t ever be the exact same type of characters, the exact same writing, the exact same plot (well, if there is, that would be plagiarism which is just stupid) and there will always be the author’s own perspective and thoughts laced throughout the story that may differ from the book it’s similar to. So though original ideas are wonderful I think we can still have books that are similar but different too…DOES THIS EVEN MAKE SENSE?! It does depend on the individual reader FOR SURE. *nods* Because we all look for different things and react to them differently, right?! *nods* I can totally understand it from this perspective too. I mean, some books are just fun FLUFF books too. And not even though. Some books are just nice to be comfortable, right? Looking at this from the author’s standpoint, I don’t write to be unique. I write what sounds fun. But I also put my soul into what I write (mostly unintentionally) and I know that someone somewhere is going to relate to what happens. It will sing to someone’s soul. *whether it be middle grade or just something not as intense. Such a great question, Cait! I love it when a book does bring something new to the conversation but it’s not something I would require of every book I ever read. A book doesn’t have to be absolutely unique to be refreshing. I read a lot of YA contemporary romance and there are so many tropes constantly being used but I never get tired of them because of different factors- narrative, writing style, twists, etc. But that makes it unique right?! It’s the author’s style or voice or that little snippet that not every book has — that’s the kind of uniqueness I want. HEH. BUT YEAH. I think all books are different. It’s impossible for any of them to be completely the same, right?! I don’t think every book needs to be bring something new to the table. There is something to be said about books that don’t…these are comfort books to me or bubble gum books. Books that have familiar tropes, that don’t require me to think much and I can just breeze through when I’m stressed or sick. I don’t always want something new and different. Sometimes the same old, same old is fine. I LOVE Battle Royale. I haven’t actually read the book (it’s on my TBR! ), but my friends and I watched the movie over and over during high school. Even though I did really like the first Hunger Games book, I couldn’t help thinking about Battle Royale the whole time and how Suzanne Collins must have been very familiar with the story while writing hers. Ahem. I’m not sure I believe a story can every be 100% original, with zero influences from anything else (unless someone has lived in complete isolation, which doesn’t happen), but I also don’t think that’s an excuse for an author to carelessly and obviously borrow ideas from successful books. And yes, I don’t think any book SHOULD be completely different from anything else. I mean, it’s just not possible, right?! I don’t even think I’d want to read it…because weirdness. I just think books should squeeze in a little something that not all other books have — even if it’s just the author’s style or voice! Hmm, I could have sworn I read somewhere that she admitted to being inspired by Battle Royale, but it was so long ago, I’m not sure at this point. OH. I didn’t know that. xD You’re probably right!! I would like to think that every book COULD have something a bit new or different to it – whether that’s the characters, the plot, the way the story is written, etc. It’s not likely to happen but those tend to be the books that stick out to me. But yeah, it’s hard to write something completely unique. Ideas are always being twisted and turned around into new stories and they will feel too similar for some readers. TRUE! As long as an author brings something unique to a story, it doesn’t matter what tropes/cliches they have, right?! Because if they just put their own spin on it…it’ll stand out. I THINK ANYWAY. haha. I think it’s okay that we find similarities in stories– tropes, plot structures, characters. Each author still has their own voice, which makes each story unique. I think the best way to “combat” this is to explore an array of genres. Sn idea isn’t so fresh in your head when you read a book, so you won’t constantly be comparing books or you won’t feel like story A is a rip-off of story B.
Hmm, that IS a good way to look at it! Especially if you like reading widely, right?! As much as I love unique books, I think if we demanded that EVERY book be unique there wouldn’t be a lot to read. It’s a hard thing to demand, and an even harder thing to write. And besides, a book being unique doesn’t necessarily equal good. I think that’s what it really comes down too: if a book borrows some ideas from another book, that’s fine, as long as it’s still an entertaining, good book. Yes, yes totally! And books can be about the most cliche trope or whatever but STILL be amazing because the other has just brought their own personal twist to it and made it theirs. :’) Those are the books I want. While I definitely enjoy groundbreaking and mind blowingly amazing books, there are times when I need something ordinary. Sometimes my brain goes into overdrive and the only way to help it is by reading something fuzzy haha. I think every book can bring something new to the conversation because no two people will tell a story the same way… even if it is the exact same story (which is why there’s room for so many fairytale retellings, for example). And, egh, yes, I’ve had books where I feel like I’ve read it 94830 million times and it bothers me?? Which is maybe silly. Maybe I shouldn’t READ tons of dystopian unless I want the “same sort of style”. But then I read a mega-unique one and I realise that you can use the same cliches/tropes aaall you want and STILL bring life and uniqueness to it. IT CAN HAPPEN. It’s amazing when a book brings something new to the picture, but I don’t even think it’s possible for it to be 100% different to every other book ever written. I mean… there have been SO MANY books written over the course of history – surely some themes have been used before in previously published books. But even taking that into account, everything is still subjective. A book ca be identical to another one and there’s always going to be someone who feels taht book is special. In the end, it’s just a matter of opinions, I guess. Mine is that originality is best. 🙂 Fabulous post, Cait! I think every book should have something that makes it unique, I always avoid those shelves in book stores. That say just like ‘The Hunger Games’ because I don’t want another Hunger Games I want something different. I think it;s okay to expect that of books. Saaaame! It’s my BIGGESt pet peeve when books are “the next Hunger Games!” or “the next Divergent!” or whatever, because I already read that. I want NEW. Yes? No? To me, originality has never been a huge requirement–yes, I like spotting new, shiny ideas I have never come across before, but to me it is all in the execution. The quality of the writing, the character development, etc. has always been the major things that matter to me overall. I only can’t stand a book when it doesn’t make me FEEL anything. Then, what’s the point? Love this post, Cait! True true! And I think a book doesn’t have to be this “NEVER SEEN BEFORE STORY LINE” in order to be unique. It can totally just be how it’s presented, right?! I mean, if I wanted to read two books that were the same I’d just reread. So I’d like for a book to have SOME aspects that are unique, even if I’m constantly reading YA contemporary books. Like with Aristotle and Dante, it’s the writing/dialogue. You know? Coincidentally, that’s why I try and steer clear of dystopians nowadays. They’ve started to all sound the same. YES THANK YOU, EXACTLY. And I think I have a deep craving for all things new and shiny. xD So when a book isn’t…I mean, I could be doing something else. LIKE EATING CAKE OR WHATNOT. *Sigh* And yes! A book can say the same stuff, it just has to present differently right? Or have a different setting. Or a different writing style. Or slip in a different message. But yes it’s a tough thing. Is it possible for a book to completely introduce a whole new thing? I mean dystopians all seem to follow the same premise: messed up government and certain people rebelling against it and such. But I totally have the same expectation. I feel like I’m always asking for a book that is unique and different. And they do have the ability to be because we all have amazing imaginations that are so unique to us as individuals. I think sometimes genres have to have certain things. Like it’s not going to be a dystopian if there isn’t a messed up government, right? And it’s not going to be an urban fantasy if there is no magic. SO. YEAH. I think a book can be full of the tropes of its genre and yet still be unique!! If they just present it differently, right?! YES YES, I totally agree with this!! (And I think you summed it up much more eloquently than me, hah, and only in a few sentences. XD Omg, I was a bit rambly today I think.) And I think even a book full of “cliches” or whatever, can still bring something new to the conversation, with just a new thought or phrase or conclusion or even style. Ahhh I know exactly what you mean! I swear, it was so much easier in the early days…..Sheesh. I get the expecting all books to be uniquely amazing part, but these days, I hardly have time for reading, let alone writing, because ugly dark shadow of school kills my social life (or lack thereof). I swear they should just like make up a new genre and write all sorts of crazy stuff for it! CAIT LETS MAKE A NEW GENRE TOGETHER. YES LET’S MAKE A NEW GENRE TOGETHER. CAKEPOCALYPSE? Me toooo. THIS IS ME. OMG. I sometimes am grateful for the generic books because it makes me appreciate the unique ones more. Is that weird?!? I think it depends a lot about the genre, author and readers. I feel that every book is unique in its own way. Some of them are uniquely amazing while some are uniquely cliche. So that makes them all different. i totally agree with all the things you said. that’s why i find rating with 5 stars really hard, because sometimes i really enjoyed a book and it was 5 stars, but then other times i absolutely loved a book and it was also 5 stars, but they are completely different in my heart, you know? and sometimes i feel like i loved a book, but i forgot about it a month later, whereas other times i thought i liked a book and i’m still thinking about it a year later. haha. but for reals. when i read the hunger games, i had never come across anything like it before, so i absolutely loved it, and i know some people hate it. sometimes i read books that are complete fluff, but they are exactly what i wanted and i enjoyed them immensely, so while they might not have brought anything new to the table, i loved them more than someone else would, you know? but you are right, we can’t expect authors to read all the books, so how can they know when something is similar? i don’t want every book to blow my mind with it’s awesomeness, but like you said, i don’t want feel ‘have i read this before?’. also, immortatliy needs to be a thing just so i can read all the books. *whispers* The Hunger Games will ALWAYS be my darling. :’) It got me started on YA and I still absolutely love and adore it. OMG HAPPY SIGH. I want immortality to be a thing too. Sheesh, why is it not? It’s like 2015 already. We need immortality to be an option. What a great discussion post! I absolutely love dystopian fiction and I know it is because of Hunger Games. That is the series that started it all for me. And of course, there are so many series that are like it but I still don’t get tired of the genre. Do I love it when a dystopian book offers something completely different and something that I have never seen before? Of course. But I don’t necessarily need something brand new. If I love the plot and the characters and if the book makes me feel EVERYTHING, then I don’t really care if it isn’t 100% different. Ohh, I love all of this! Dystopian can be fantastic and I love so so many dystopians…although I feel it’s my most “I am wary of this” genre because things tend to sound the same for me. *sigh* But, omg, totally. If the characters are 100% perfection than I don’t even care if the plot’s cliche. I WILL STILL LOVE IT. *nods* This is very true. Books can blend so easily, and like there AREN’T exhaustible ideas in the world. It’s just how you approach those ideas and how your writing style makes them come together. But I do like the books that are just totally DIFFERENT. I wish there were more! This post is fantastic, Cait! I totally agree with you on when you say that you wish “every book could bring something new to the conversation”, I constantly crave books that are unique as well, but understand why you’re posing this question. In fact, one of the books I’m reading right now is quite unique, but at the same time there are so many aspects of the book that seem so glaringly unoriginal to me (for whatever reason) so it’s really taking away the enjoyment of the book for me. Eeep! Thanks, Alexandra! 😀 I almost don’t mind if the book is like 70% unoriginal and only 30% unique…mostly because, like if it’s a trope that they’re rehashing that’s been used a DOZEN times — it can be still interesting to read if it’s just mixed up a tiny bit. But gah, I get so bored when I feel like I’m reading a book and it’s deja vu. I think every writer wants to bring something new to the conversation, but it’s hard when so many books are constantly coming out and every new book is billed as this book plus this book, so you already have an idea in your head. I of course love when I find something new to me, but I like your point that it’s really all perspective and what you’ve read before. I feel like something has to be unique in the book but not everything, if that makes sense. Like you said, not every book can be mind-blowingly unique, but I think that the best books have SOMETHING special about them that no other book has. It can be the voice itself, and just a feeling you get, not just a specific plot. But even in the sea of dystopians I read once upon a time, some stuck out above the rest. Not because they were even particularly fresh, but because there was some twist on it, some new and appealing perspective. I almost can’t even put it into words. Unique doesn’t always equal special. and special doesn’t always equal unique- though a book that is a near replica of another book won’t succeed, most likely. Themes and ideas have to be personalized, spiffed up, made the author’s own. It’s easy to tell when they are… and when they aren’t. YES YES. OMG YOU SUMMED IT UP SO WELL. I rambled on for like 500 words trying to say it and you put it in just a few sentences. XD I think a book doesn’t have to be utterly unique…and it can use tropes and things (tropes aren’t even bad!! So long as they’re done well!!) I just think every book should have a little something that makes it its own tale. I don’t think it’s too much to ask! And I totally agree with you. Every book should bring something new – even if it’s something small. I kind of see that as the author’s responsibility. OMG GOOD, THEN. I’m not demanding unreasonable things. XD And like a book can be full of tropes and “normal” plot devices and all that…but it can still stand out with just a little tweak of awesome, right?! I don’t think it is possible for every book to be unique and for me that is OK. Sometimes when I am feeling under the weather I like to read a book that is easy and fluffy and where I know exactly what to expect. when it comes to fantasy or sci-fi or especially dystopias, I like original ideas. they hold my attention a lot better when I’m reading something that definitely wouldn’t happen in real life. however, when I’m reading contemporary fiction or *le gasp* a fluffy teen romance book, I’m a little more lenient when it comes to originality. then I focus more on the uniqueness of the characters than on the plot or idea behind the book. I totally see what you mean. XD And honestly?! Sometimes it’s nice to have fluffy contemporaries that don’t make the braincells hurt, if one needs a book that gives them a break, right?! This is a neat topic of discussion. For a book to be marketable to a publisher it has to have some form of uniqueness, but it is true some books stand out more than others and those are the ones that become more successful. I think an author should try to be unique in their works. I know as I writer I do. Form writers such as James Patterson or Stephen King could get tedious after a while. I think the originality of a story may have SOMETHING to do with my love for it, but not entirely. After reading and loving Hunger Games, I also read Fire & Flood, which many have compared in some ways… but it didn’t bother me one bit. Even though both stories were about children fighting for a cause, it didn’t seem too copycat. I have read some, on the other hand, that are way TOO similar that it just aggravates me. Maybe some of it is the amount of books you read each year since you read A LOT more than I do. I also tend to read more contemporary (by far) than anything else, and let’s face it… contemporary is all pretty similar. So I’m used to it. Whereas fantasy books really sore to the top of my favorites list when they are completely unique and unlike anything I’ve ever read. For example, since I read so few fantasy books, I’m reading Throne of Glass right now and it’s THE BEST THING EVER!! Maybe that’s because I’ve read very few fantasy books so everything about it seems pretty unique to me. Or maybe it just really is that amazing. Either way, I’m loving it. I think Fire & Flood is definitely different. *nods* Because they’re like doing a survival race, more, right? Instead of just outright murder. I did like that one too. heheh. STILL NEED TO READ THE SEQUEL THO OMG. So many books. I mostly read YA and NA romance, and I’ve discovered books in these genres to be pretty repetitive. A few times, I’ve read books that have basically been carbon copies of books I’ve already read, just with different character names and slightly different settings. Obviously, if you’re spending money on books, it can be really frustrating to feel like you’re reading the same thing over and over. So yeah, I think freshness is really great – but I do understand that it can be difficult to achieve sometimes. Effort is always appreciated, though! I’m not sure how to answer the whole, “If EVERYTHING is different, does that mean NOTHING is different?” question, though. My brain just kind of switched off, like it’s incapable of comprehending such a question at almost 1am! Haha. This was a super long and mildly nonsensical comment, but thanks so much for a great post. Also, your blog is so beautiful, it makes me want to do a small cry. I also remembering reading THG and absolutely being blown away! I’d been a pretty shelter reader before that because I didn’t like scary things and to this day, it’s still one of the best reading experiences ever. I wish I could re-read it for the first time again! I wish every book brought something new to conversation, but truthfully, that’s new going to happen. Some books are just for fun and they’re not going to inspire conversation. But that’s not to say it’s not good in it’s own right. Plus, original ideas are rare to find these days. Even when you think you’ve got one, a few months later you’ll see something that resembles that or is similar. Am I making any sense? The Bachelorette has turned my brain! *logs off to concentrate* Fantastic discussion, as always! But at the same time, I’m like, NO. Because I feel like in the principles of literature in general it isn’t always about the novelty of books, because it wears off quickly and in fifty years all the books we post about will be out of print and no one will care. It’s a lot of times about the same. Why do we still read The Great Gatsby? Why do we still read Shakespeare? Why do we still read a lot of people who died a jillion years ago? Because even though they are the same, they still resonate with us and in getting more of the same it resonates with us and our lives even better. More often than not I take to the second option when it comes to books… And so like… It’s a stupid hard balance. You know? 90% of the time I would rather reread something amazing…. but then you want novelty. BOOKS IS HARD. HMM I DON’T KNOW. This is the time where I question whether I would prefer a story that had the same plot as another book I’ve read, but just pulled it off better (writing wise, character wise, etc.). Then I think I wouldn’t mind that it isn’t different. Then again, I love reading new things, especially when it’s a new twist on something. Hard question you ask here Cait. Short Answer: I DON’T KNOWWWW. Awesome question! I think each book needs to be its own unique snowflake but I don’t think it always needs to bring a new TOPIC to the table. There are still lots of things that need to be talked about in various aspects and books can have very similar plots to do just that. I think as bloggers/avid readers we do tend to exhaust things that are so specific — like dystopian, vampires, etc — because it seems like there’s only so much you can do with such a specific idea. It’s one of the reasons I love fantasy and contemp/realistic fiction. It just seems like the possibilities are endless! I also do love my good fluffy contemporary books that really don’t bring any “issues” to the table but they’re there for fun reads. That also doesn’t mean that they don’t bring up questions — friendships, families, figuring things out about yourself. There’s always something no matter the book! I agree, seems like a fair request for me. I hate when I read a book and it just reads like a ton of other books in the genre. A book should always have something that makes it stand out from all the others, makes it different in some way. If a book is just like every other dystopian out there then it won’t stay with me. I’ll forget the book, I won’t be recommending it and I’ll probably not be too tempted to try anything else the author writes. EEEP. ME TOO. Because it seems like a waste of time to basically read an identical plot line twice, right??? And I know no book will ever be EXACTLY the same. BUT. I still would like to see more variety and surprises! !